The entire Piedmont Basin, 80% of which lies in Pennsylvania, empties into the Delaware River and is part of the Delaware Estuary. 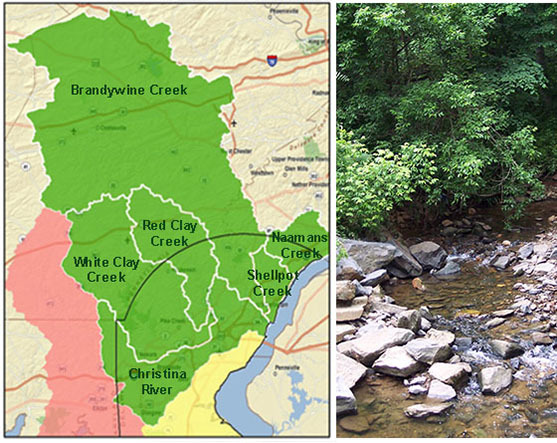 The Piedmont Basin contains the Brandywine Creek, Red Clay Creek, White Clay Creek, Christina River, Naamans Creek, and Shellpot Creek watersheds. 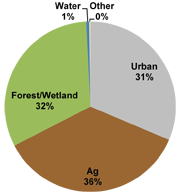 The Piedmont Basin supplies a significant source of freshwater from both surface water and groundwater sources. The largest surface water supply for the Piedmont Basin is the Delaware River, yet use is limited to industrial cooling due to the brackish-to-saline nature of the water. The Brandywine Creek serves the largest surface water drinking water supply with most of the Brandywine drainage area in Chester County, Pennsylvania. Other sources of surface water supply include the Red and White Clay Creeks and the Christina River. Groundwater provides base flow to streams and wetlands and it supplies water for domestic, public, and industrial users. Compared to the remainder of the state of Delaware, where groundwater is essentially the sole source of fresh water, the Piedmont Basin has significant fresh surface water resources, which support the majority of human needs in the area. The tidal waters of the Christina River support a striped bass fishery and spawning grounds, while the nontidal waters of the Brandywine Creek provide exceptional smallmouth bass fishing habitat. Sampling conducted by the Delaware Department of Natural Resources and Environmental Control (DNREC) in 2010 show that there are abundant anadromous fish species present and spawning in the White Clay Creek, including American shad, Hickory shad, White perch, Striped bass, Alewives, and Blueback herring. Efforts to remove the barriers for fish to migrate further up the Brandywine and White Clay Creeks are underway. More than 90 percent of Delaware's Waterways are considered impaired. "Impaired waters" are severely polluted waters that do not meet water quality standards. The state's list of impaired waters, filed with the Environmental Protection Agency, includes 377 bodies of water that suffer from 11 different impairments, the most common of which are pathogens and nutrients. Most impairments come from non-point sources of pollution, which are difficult to control. Pollutants in Delaware waters are often chemicals, such as nitrogen and phosphorus from fertilizer runoff. They can come from specific "point" sources, such as sewage treatment plants, or from "nonpoint" sources, like runoff from lawns, farms, parking lots, and golf courses. The geologically unique Fall Line located in the Piedmont Basin runs through a line stretched between Newark and Wilmington and separates the hilly, rocky, Piedmont from the flat, sandy Coastal Plain Provinces. This transition zone results in a wider array of flora and fauna and enhances the opportunities for nearby researchers. Parks, recreational facilities, and open space are an important part of the social, cultural, and physical fabric of the community and are abundant in the Piedmont Basin. The Brandywine Creek hosts many canoe and kayak enthusiasts at public boat landings and commercial liveries. The White Clay Creek State Park, Brandywine Creek State Park, and numerous municipal and state parks provide hikign and biking trails for the community. Freshwater trout fishing is available at six designated trout streams within the basin and 19 miles of streams are stocked annually with trout--the only trout-stocked streams in Delaware. One of these trout streams, White Clay Creek, has a fly-fishing-only section, providing anglers an unparalleled experience within the state. Another unique fishing opportunity in the Piedmont Basin is the Brandywine Creek, which provides the only sustainable smallmouth bass fishery within the state. Public access for boaters is limited, with only three public boat-launching facilities, although recreational opportunities for non-motorized boats--canoes and kayaks--is quite popular. The Piedmont Basin supports a flora of great variety, including many species that are rare or nonexistent in the Coastal Plain. The Piedmont supports the highest acreage of mature, deciduous woodlands in the state. The forest are composed of a mixture of hardwoods, dominated by oaks, beech, tulip poplar, hickories, and sweet birch on the steep slopes and dry ridge tops, and by box elder, sycamore, sweet gum, slippery elm, red maple, tulip poplar, and sometimes river birch and black willow along narrow stream-side forests.